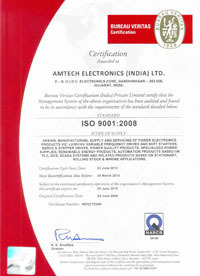 Amtech, a leading manufacturer of technology products in the field of motion control, automation, power quality and industrial electronics solutions, aims to meet future customer expectations. Amtech's innovative approach to R&D, coupled with dedicated customer service and support, has ranked Amtech as a leader in the power quality solution provider. The company's ongoing efforts include successful implementation of innovative and comprehensive power quality and harmonic analysis as well as Power Quality Solutions like Active Harmonic Filter, Active Front-end Converter that span the industrial, commercial, and utility sectors. The company is ISO 9001: 2008 certified and the products comply with International safety, environmental and electro-magnetic standards such as CE and UL (as applicable). Equipment and systems are shipped and commissioned on-site only after undergoing stringent in-house 100% testing. Protecting your power equipments against the poor power quality is one of the big issues right now. There are many choices of equipment and manufacturers. How do you know which is best suitable for you? The most expensive solution is not always the right solution for the problem. Correct identification of the power problems and company’s needs should be addressed to reach to the optimum solution. This is the area where Amtech can help you. Our qualified power quality auditor will not only identify power quality issues within your company, but will also help you to assess your specific needs. The auditor can then put together a recommendation that meets your needs without unnecessary expenses. Let us help you protect your facility, productivity and profitability. Contact us to learn more or to arrange a professional consultation.